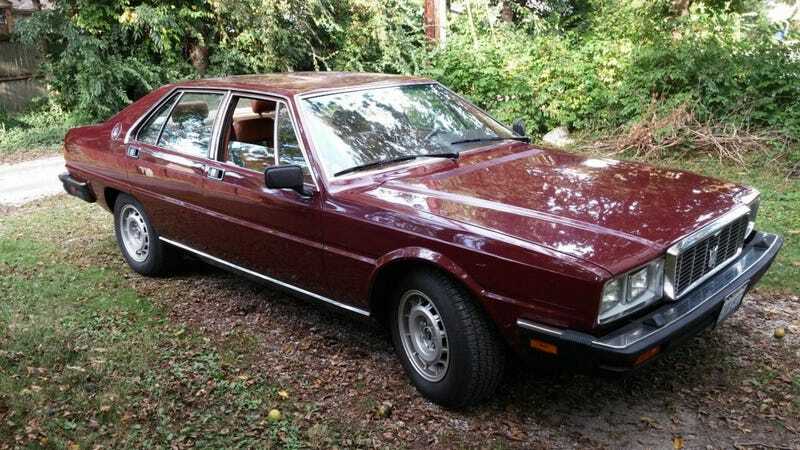 For $10,500, Could This 1984 Maserati Quattroporte III Be The One For You? Is there any more literal automotive name than that of today’s Nice Price or Crack Pipe Quattroporte III? I mean, it means four-door number three! Let’s see if its price has the numbers that really count. Absinthe, the anise flavored alcoholic beverage, was once banned in the U.S. due to its reputation for containing the chemical compound, thujone, which considered a highly addictive hallucinogenic. That’s been proven mostly false, and today the spirit is widely available—hell, you can even buy the booze at BevMo! The time may have come for Absinthe in the U.S., but the clock is likely still ticking on yesterday’s 2003 Renault Clio V6 Renault Sport, a car that’s presently generally considered taboo in America. That hasn’t stopped this one from slipping in, and we had it up for grabs yesterday at $69,000 and with the promise that it had been legally imported. That’s open to interpretation—legally could mean for off-road use only—and that potential hanging chad left the Florida-based dealer with a 78 percent Crack Pipe loss. At least he can drown his sorrows in Absinthe. Maserati has long had an on again/off again love affair with the U.S. market. Today, the Italian company seems almost mainstream, offering five different models, one of which is an SUV. That may be the ultimate kowtow to American tastes—we do like to sit up high and pretend we’re all truckers, after all—but geez does the world really need a Maserati crossover? I think not, but then I also think that the world does need clean older Quattroportes like this 1984 Series III. Call me crazy. What we have here is an example of the Giugiaro-designed sedan in burgundy over… well, I guess that’s tan but it looks a little orange in the pics. You know that orange is “in” right now, right? These are cars with presence. Or, if you’re less charitable, they are just big lumbering beasts. Either way, there’s no denying the appeal of being ensconced in this much buttery-soft leather and handsome burlwood. You’ll also no doubt appreciate the climate controls that are shared with the era’s Plymouth Horizon. That somewhat jarring detail will likely be forgotten as soon as you fire up the 4.9-litre DOHC V8. That was supposed to be good for 288 horsepower per the factory, and with a quartet of Weber two-barrels and repeated MASERATI script on the intake and cam covers it’s as lovely to look at as it is to hear. The engine may not be as energetic as you might hope as it does have nearly 4,300 pounds of car to drag around. In fact, the seller claims that this Maser sadly won’t do 185, as legendarily promoted by musician Joe Walsh. Top speed is actually more on the order of 130, but that’s fast enough, right? The car comes in remarkably clean and unmolested condition. There doesn’t seem to be any rust, and the leather interior looks to be perfectly serviceable, extant some fading on some of the surfaces. On the outside, the paint is giving up the ghost on the roof, and there are some small dings here abouts, but it all seems otherwise very presentable. Factory alloys with new BFGs underpin, although all four wheel centers appear to be AWOL. Behind those missing caps are rebuilt brakes and new rear shocks (there are four of those). The engine has seen some work too, as the ad notes that the heads have been pulled and decked with reseated valves and new seals. The fuel system also has seen some attention with some new piping and carb updates. The seller claims that 95% of the dash electrics work, which is actually pretty good for an old Italian exotic. Mileage is a modest 31,000 and the car comes with a clean title. The present day Maserati Quattroporte is a better car in just about every way than this ’84, but then again, a new one starts at over one-hundred grand, and depreciation on them is like falling out of an airplane. At $10,500, this one’s probably about as cheap as it will ever get. Of course, we’ll still need to decide if we think that’s cheap enough. What’s your take on this classic Quattroporte and that $10,500 price? Does the presentation and the work make it seem to be worth that kind of cash? Or, is that price the wrong number? H/T to Jason for the hookup! For $69,000, Would You Make History With This Uber Rare 2003 Renault Clio V6? For $12,000, Could This 1990 Chrysler TC By Maserati Hijack Your Heart?